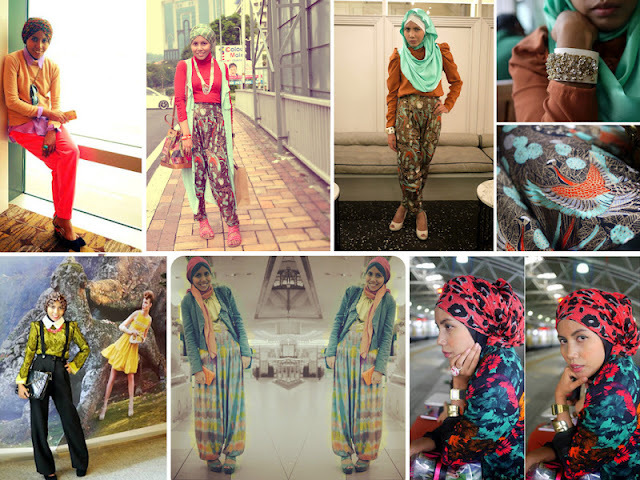 What So Sizzle Bout Sizzling Suzai - Malaysia Fashion, Travel and Lifestyle Blogger: HFW DAY 7: "Style Crush"
HFW DAY 7: "Style Crush"
Salam and Happy Sunny Sunday..
All the photos were taken from her Official blog AMI SCHAHEERA and her Lookbook.! so, here are some of her fashion forward styles that i've combined by myself before asking her permission LOL. hehe..hopefully, she will approve it soon. as you can see, she is extremely courage enough to play with the styles. she is never afraid to try something new, something BOLD, might be something weird to somebody and might be also something other people don't think to wear! that is why her sense of style is very admirable to me as i salute her bravery attitude and yup, her mix 'n match is never fails! thus, mine up there is the innocence combination of an ANIMAL PRINTS with the BOLD ELECTRIC blue maxi skirt which i've never wore one of the items before. 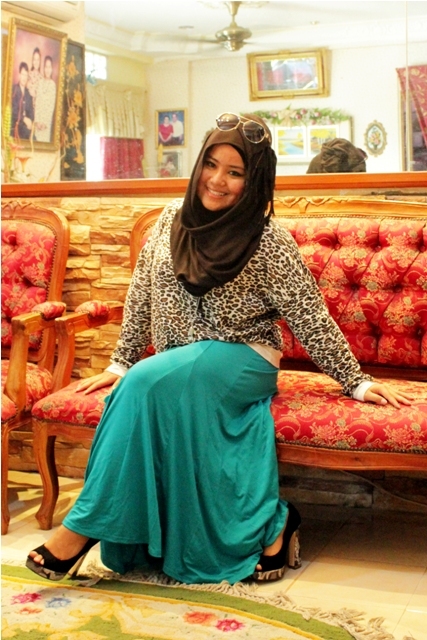 the leopard prints is quite bold but as i pair with a plain black pashmina, it naturalize it automatically. 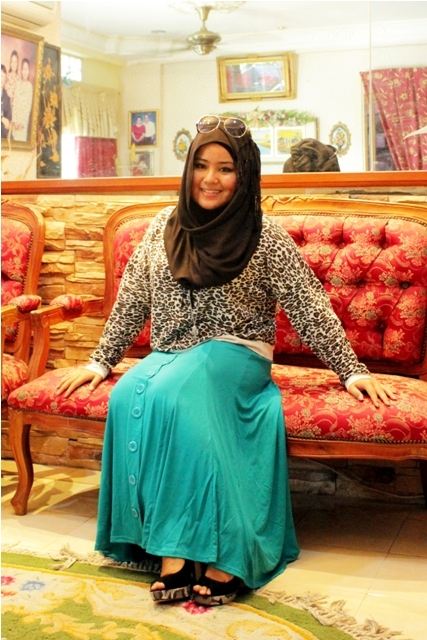 while, the maxi skirt is extremely gorgeous and flowy plus the cotton material of it is giving max comfy to me, make it one of my current fav right now! although, the look is screaming "playing too safe" but i'm absolutely comfortable to leave it like that as IT IS ME! again this is the LAST DAY OF HFW MAY 2012. thanks to all the lovely viewers especially WAFA from HFW crew. ^^ flying kisses to you gal for never tired of organizing this great online fashion event! insyAllah, i'll always love to support it again-and-again! HFW MAY 2012 DAY 1: " Leaders in Hijab"
Salaam! Very daring of you to choose Ami Schaheera as your style crush, but you look great! I love the skirt! I'm glad you enjoyed this season of HFW!!! Cool outfit :) Love it, specially the colours! Salam. 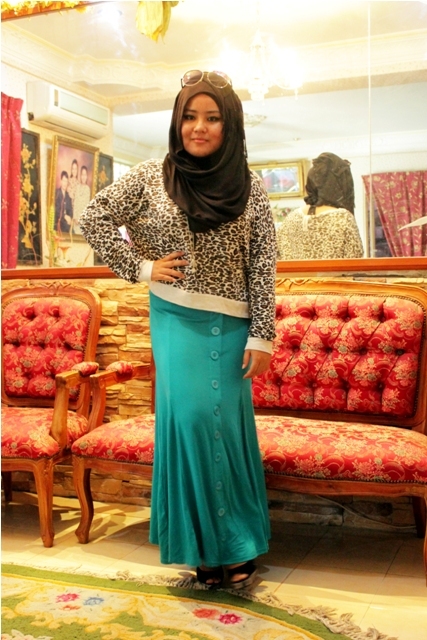 Love this outfit, dear.. The green skirt, in particular. zulaiha-->dear tq sooo much 4 sharing...hmmmm insyAllah i will but as for now im still waiting n WORKING for an eng-related job offers huhu..klu giler stahun pon xpat gak haha i AKN APPLY KJE ITU, i know its gonna b sooo much of fun but...hm.... >< still tq dearest..im fully appreciate it! it take a year and there will help you find a job.. and get 1000 per month with free tmpat tinggal n maknan..